Just like the winds that blow through Wyoming, the thoughts posted here are varied - some a strong tirade and others merely a whisper. 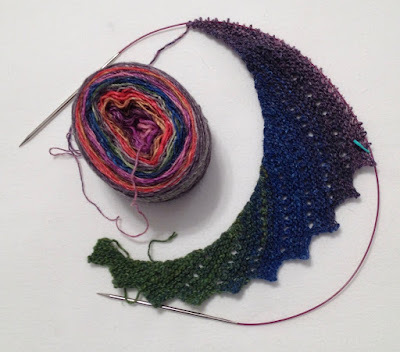 I'll admit that my knitting has taken a back seat to sewing this summer, but over the weekend, I got the urge to start another Hitchhiker scarf. This time, I'm venturing out of my usual comfort zone for color. Thanks to Noro's vivid colors, this scarf is definitely going to be cheerful and unique. Adaptations: on the eighth row of the pattern, I've added a simple eyelet lace: follow pattern for bind off, then (K2tog, YO) across the row. At the end of the row, follow the pattern's directions. Last summer, Marilyn, Brenda, and I visited The Nelson-Atkins Museum of Art. 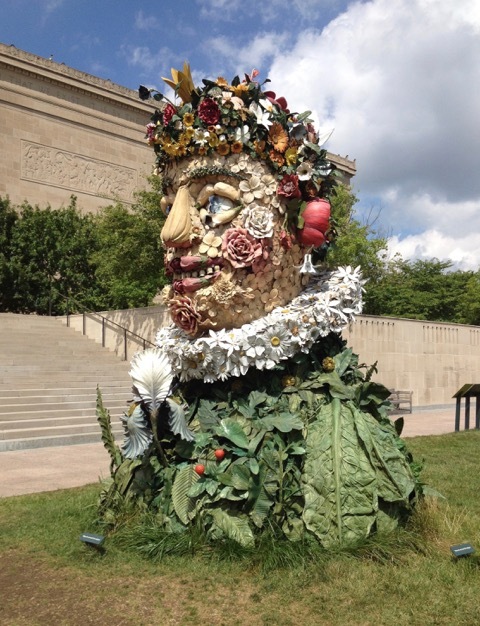 The featured outdoor sculptures were the Four Seasons, created by Philip Haas, displayed in front of the museum building. 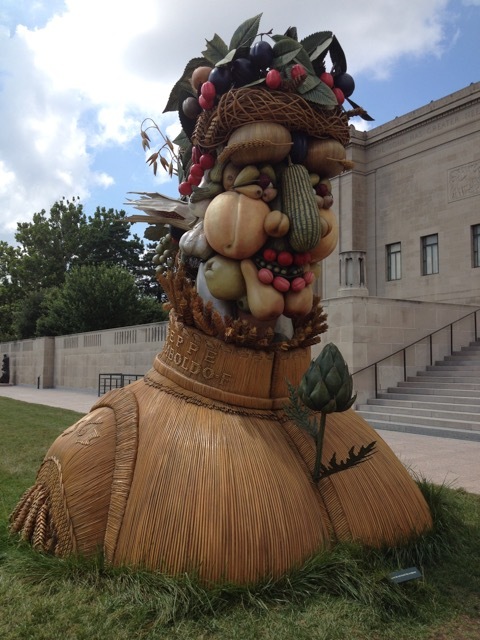 I didn't care for the "summer" sculpture, so I didn't take a photo of it. The sculptures were 15 feet tall, and three-dimensional. 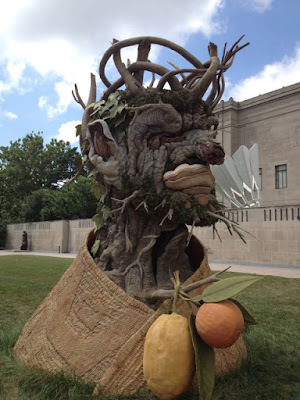 The artist had quite an imagination: I love the whiskers on Winter. 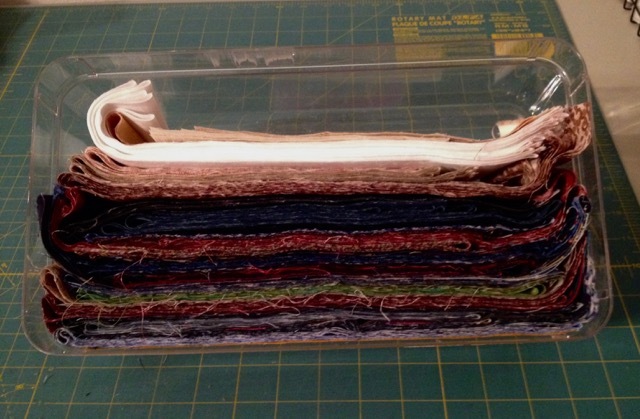 All the subcuts have been sewn into four-patch units. Shown in the plastic box and on the pressing table are 321 four-patch units. 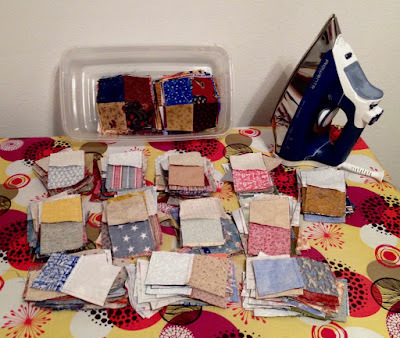 I'll sew some of them together into sixteen patch blocks. When I started this project, the 2.5 inch strip bin was so full the lid didn't fit. Even by making the 321 four-patch units with strips from this bin, the bin reflects only a slight reduction. At this rate, I will never completely empty the bin or at least make a major dent in the 2.5 inch scraps. Dwight (nephew), Bruce (nephew) and Katie (Bruce's wife). I've hiked to the Middle Fork Falls in Sinks Canyon three times - twice when I was in college and the final time with some family members at the 1999 family reunion camping trip in Worthen Meadows. 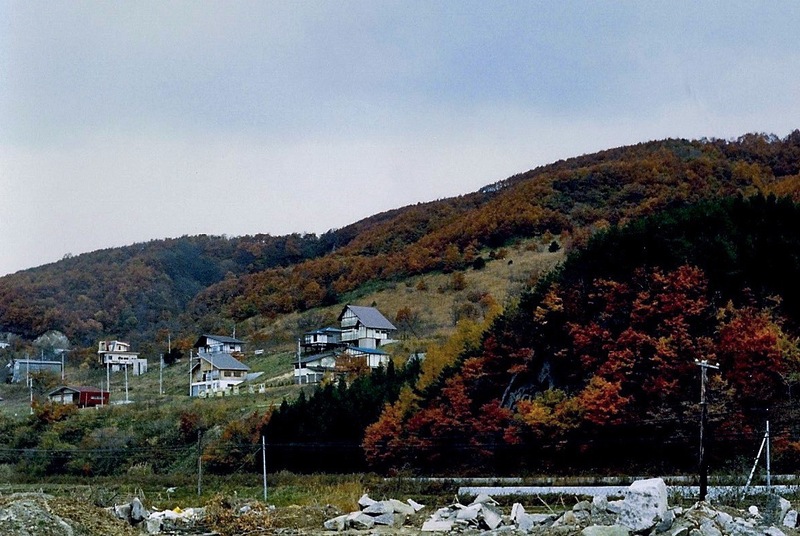 I doubt my knees would allow me to make the hike yet another time. According to the Sinks Canyon State Park website, the hike is 3 miles round trip: The first ¾ mile of the hike is easy, the second ¾ is moderate (rocky trail/elevation gain). The trail is rocky and narrow in places, is open and unshaded. 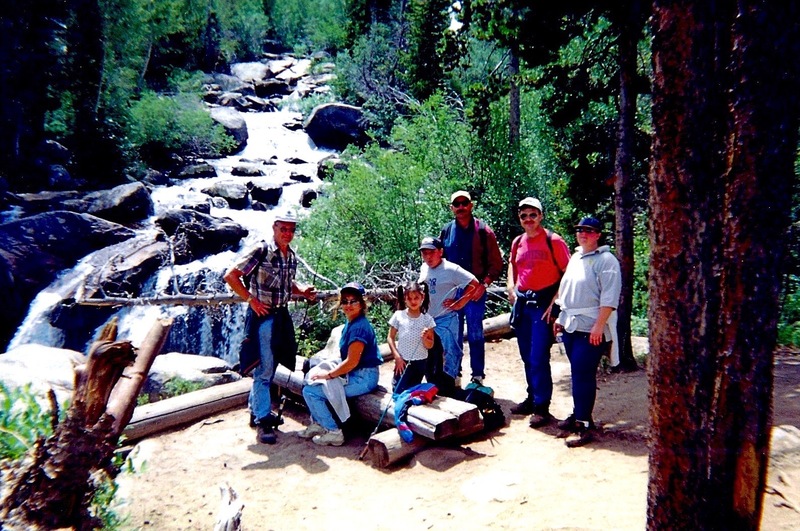 Hikers will gain over 660 feet of elevation over the course of the mile and a half hike. The elevation of the falls is 7800 feet. 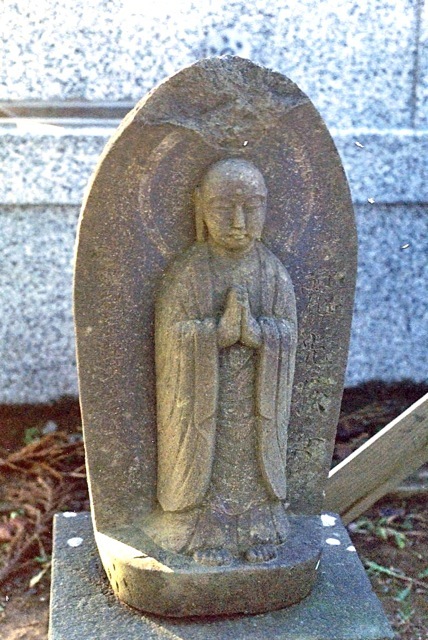 One of the older cemeteries in Misawa was located close to my home, and I loved to walk there as the shadows lengthened in the Fall. I'm sure this was a family plot since all the headstones are similar. Marilyn and I are planning another sew-in sometime this summer, so I cut all the pieces necessary from a 1930s reproduction, quilt kit I purchased several years ago. I couldn't resist making a sample block. 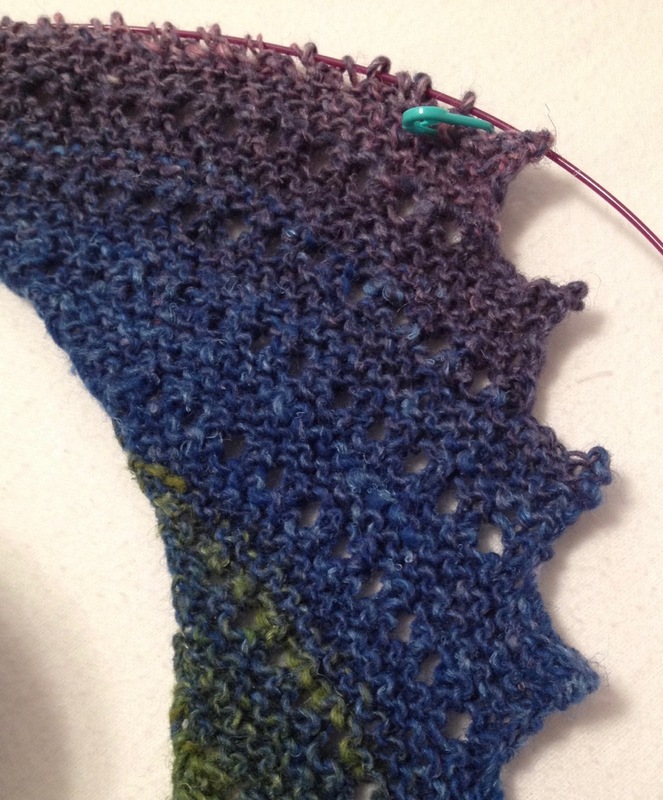 It's going to be difficult to resist the temptation to work on this before the sew-in. 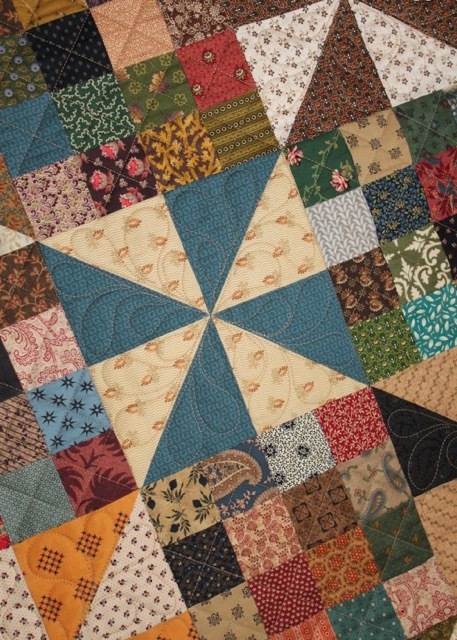 This quilt will not be a Quilt of Valor, as I'm making it for myself. 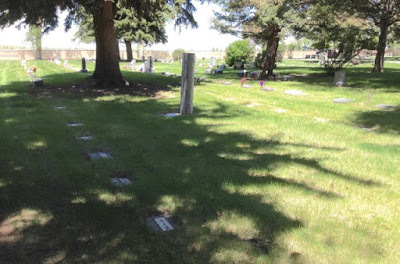 Every headstone in a cemetery can tell a story, and the unassuming ones in a shady section of the local cemetery certainly could speak volumes about the history of the DuNoir area of the Wind River Range and the men who formed railroad ties with only a broadax. In the High Country, the area surrounding Dubois, WY and the Continental Divide was the realm of The Knights of the Broadax from the early 1900 - 1947. 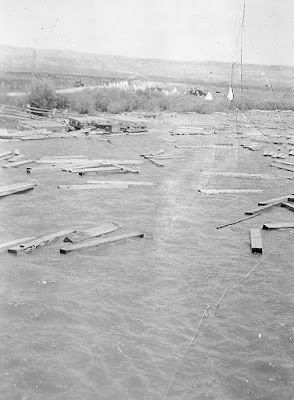 A majority of the young tie hacks were Scandinavian - from Sweden, Norway, Denmark and Finland, and the ties they formed with the broadax were stockpiled near where the trees were felled until spring thaw and then floated down the Wind River to the tie yard in Riverton, Wyoming. 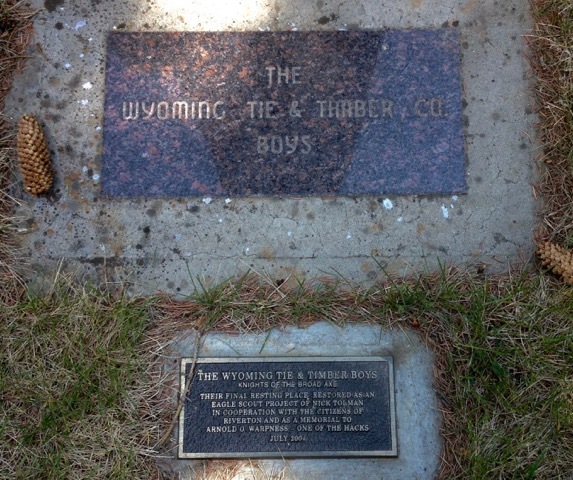 The Wyoming Tie and Timber Company produced over ten million ties for the Chicago and Northwestern Railroads from the early 1900s into the mid-1940s. 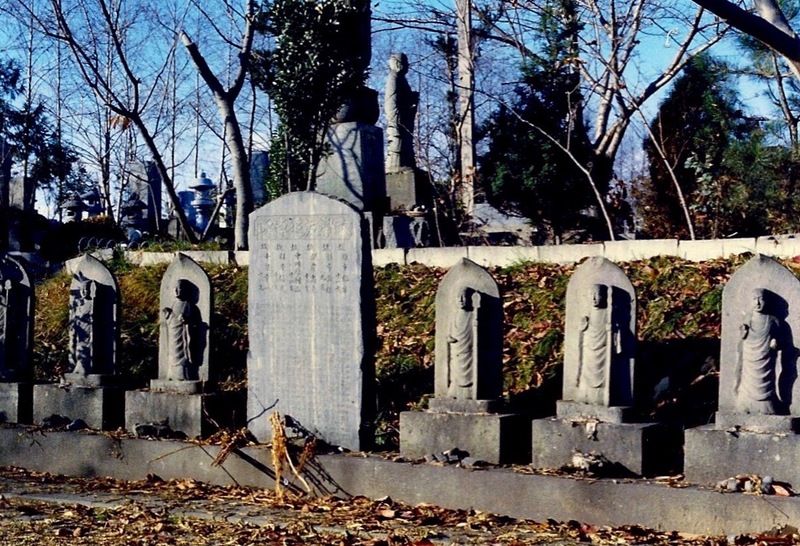 The company was sold in 1947, and the reign of the Knights of the Broadax ended. The only way to transport the ties was by water, and in 1928 elaborate flumes were built in the mountains to move the ties more efficiently from the high country to the streams and river below. Some sections of the flumes were suspended by steel cables because the canyon walls were so steep: the Canyon Creek flume, at one point, plunged down at a 45 percent grade. Only 2,200 feet long, it dropped 1,800 feet. 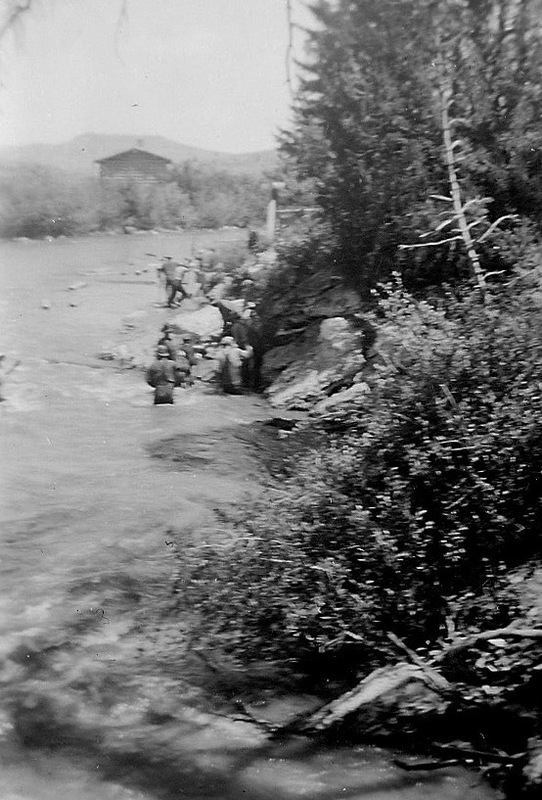 My parents took a road trip to view one of the last tie drives in 1946 or 1947, and they took the next two photos near Diversion Dam. Because of the dam, the tie hacks had to skillfully maneuver the ties through the dam's spillways. 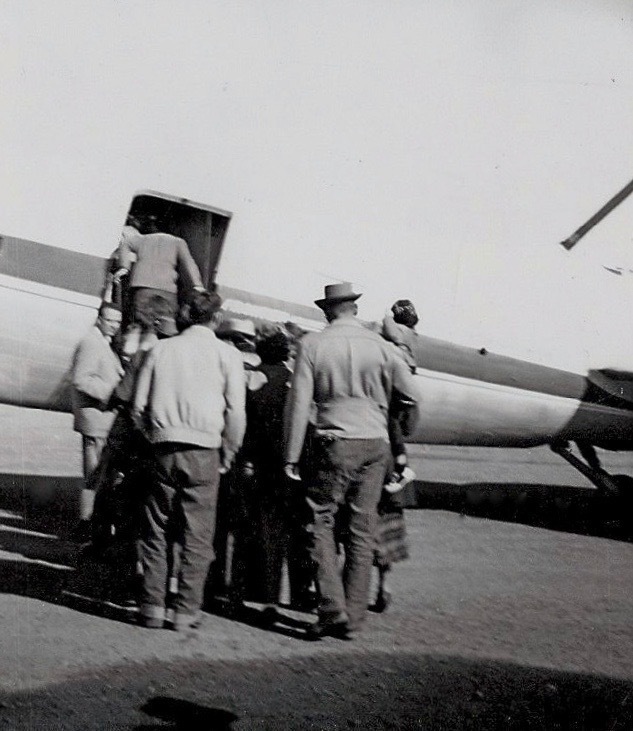 Amazing photos of the ties' journey to Riverton can be seen in the book KNIGHTS of the BROADAX by Joan Trego Pinkerton. The book is a good read (most of the information for this post came from the book), and the photos in the book make the words come alive. I purchased my copy of the book from the Dubois Museum several years ago, and I'm sure they still have copies available. 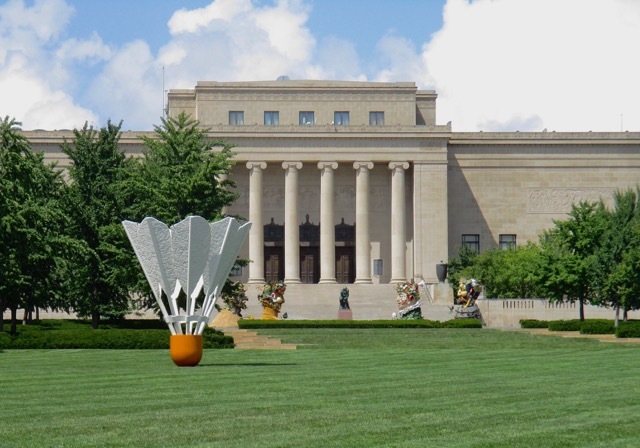 The contact information is at the bottom of this museum page. More information and photos on the history of the Tie Hacks can be found online: Wyoming Tales and Trails, and Wonders of Wyoming. 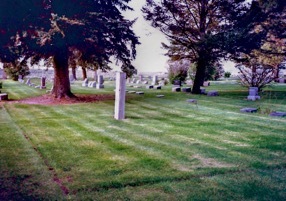 One evening in 1987, I took the following photo - it was the first time I had seen the mysterious section of the cemetery. 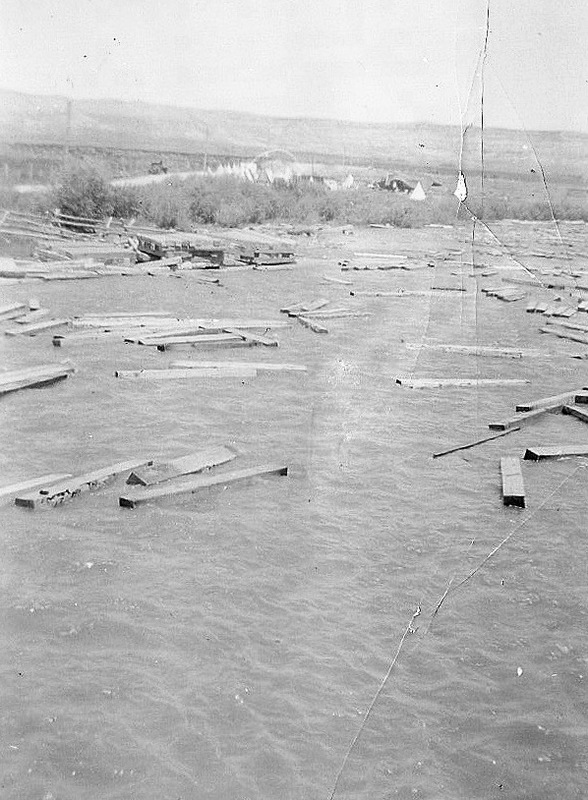 Except for the large wooden tie in the middle, the area looked vacant. The grave stones were not visible, and the wooden tie had nothing that identified it. I assumed it was a tie hack plot, but nothing confirmed my thoughts. 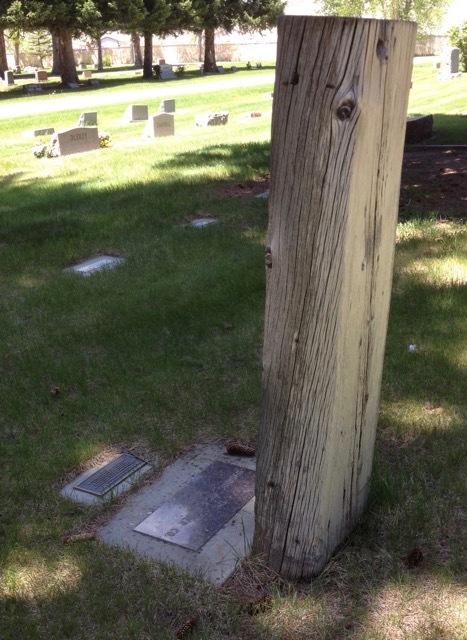 Today, a solitary, hand-hewn tie stands proud in the cemetery, surrounded by the unassuming graves and simple headstones of the men who made a lasting impression on the Wind River Valley. 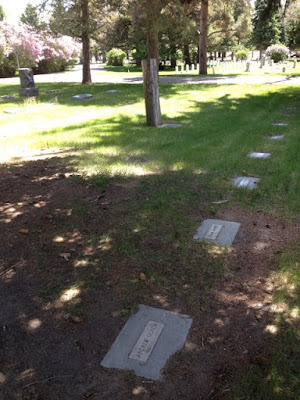 Their final resting place is in the town where the tie yard was located - nearly 100 miles where the trees were felled and the ties formed with a broadax, a tool of precision in the hands of a seasoned tie hack. little did I know. . . I've been slowly working on the 2.5 inch strip sets from last week's post and have made visible progress. The smaller scraps and some longer ones have been sewn and then subcut into 2.5 inch sets (two patches). The shoebox-sized plastic bin is full of the subcuts. Note: Tracy asked how I selected the fabric for the strip sets: it's controlled random, as I try to have a fabric that "reads" light and one "reads" dark in the sets. Since the four patches and the ultimate sixteen patches are going to be scrappy, I don't want to coordinate the fabrics too much in the strip sets. Next step - pairing these subcuts and making four patch units. 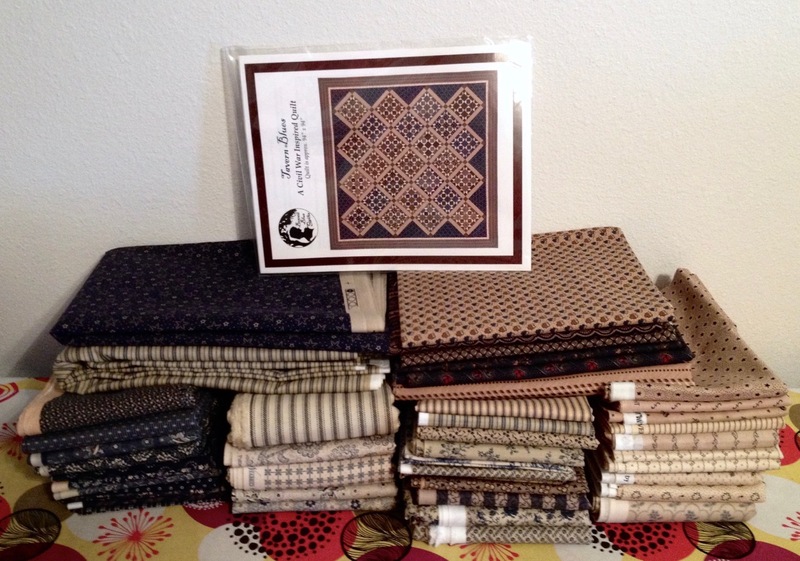 Several years ago, I purchased a clearance-priced, quilt kit with several fat quarters (FQs) and a pattern. I didn't care for the kit pattern, but I knew the fabric would make a nice Quilt of Valor. 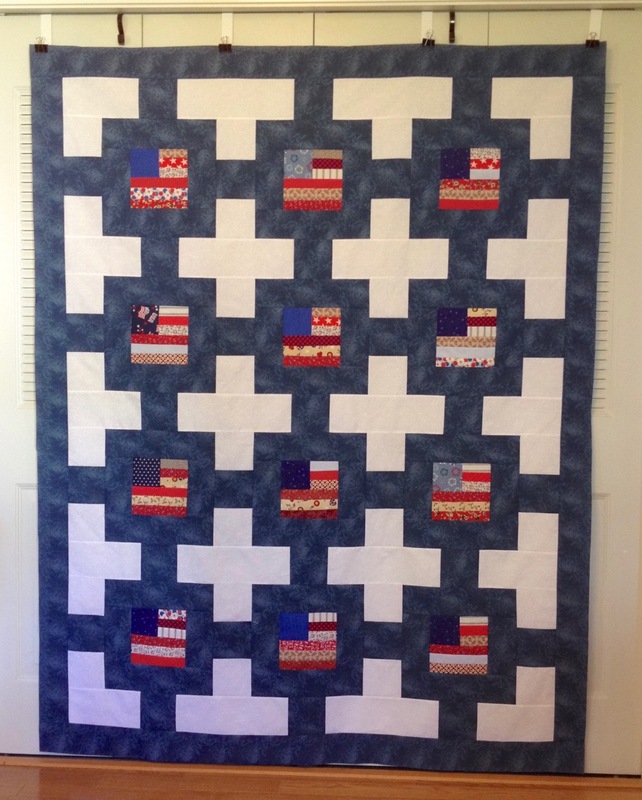 I used Pat Fryer's, Stars N Stripes pattern from Villa Rosa Designs. 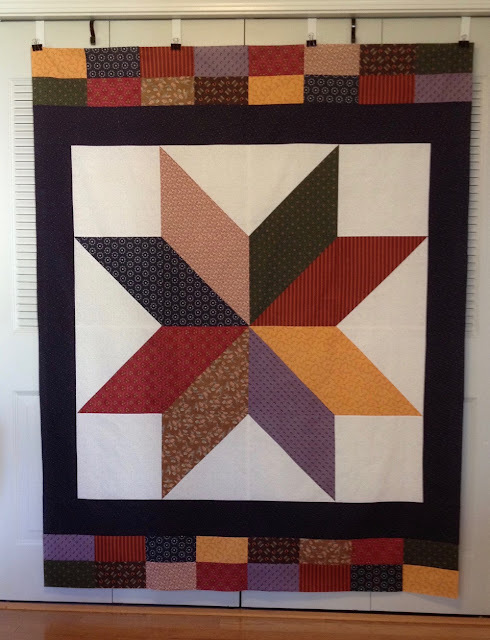 The pattern was also used to make Star Struck - QOV #23 in 2012. When I have an odd bit of fabric remaining from a project, I cut it into useable sizes: 10", 8.5", 6.5", 3.5" squares, 3.5 x 6.5" rectangles, 3.5" and 2.5" strips. Those precut scraps are then placed in plastic bins so I can use them later. 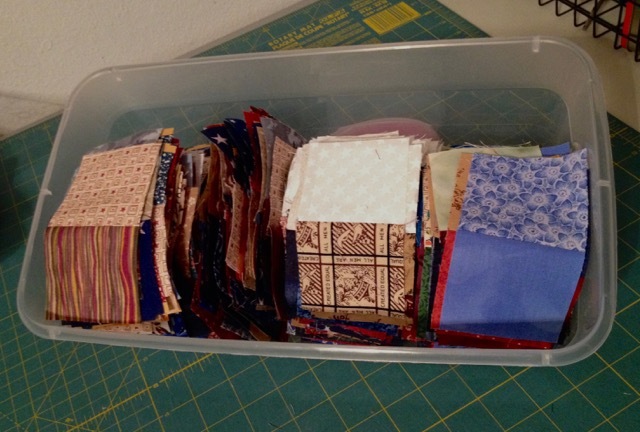 Most of the scraps come from backing and binding scraps, but others come from leftover bits of other quilts. The 2.5" scrap bin was so full I couldn't keep the lid on it anymore, so I'm sewing strip sets of lights and darks, and then cutting the strip sets into 2.5' sections. 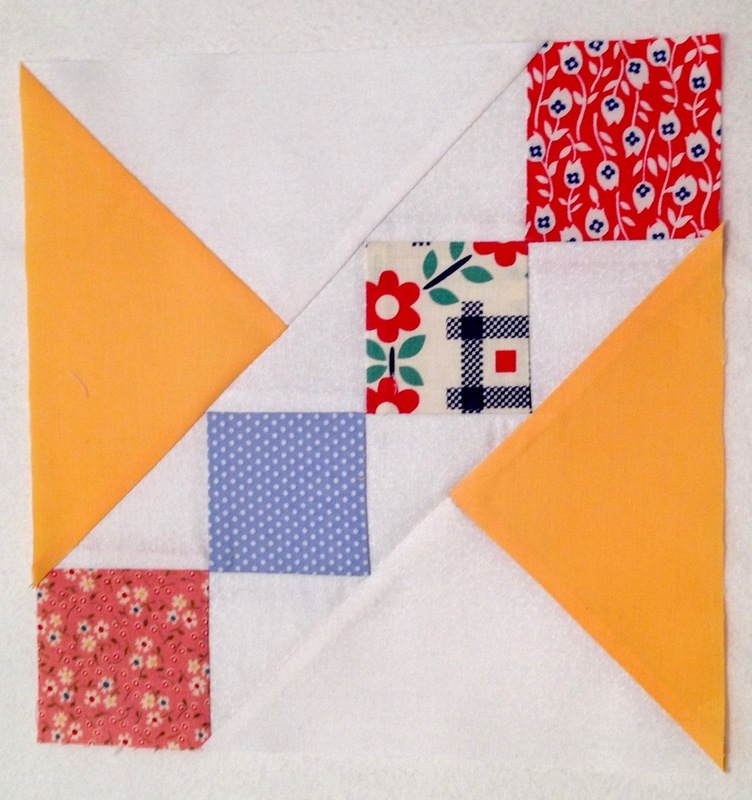 Those sections will be used to make four-patch blocks. Right now, I'm planning to turn the four-patch units into sixteen-patch blocks and combine them with pinwheel blocks to make something that will resemble the above photo I found on stitch by stitch. 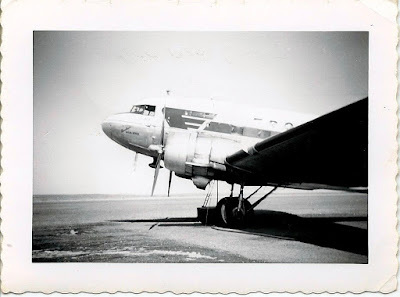 A few weeks ago, I posted two photos taken at a 1947 airplane exhibition in Riverton, WY. 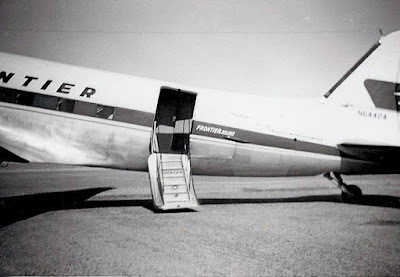 Today's photos were taken in the early to mid-1950s of a newly formed airline - Frontier Airlines. From this photo, obviously taken by my Mom, it appears that those visiting the airport that day were allowed to enter the plane, which makes me wonder if rides were also given that day. If so, it would have been my first airplane ride. Last summer's trip across Kansas included a stop at the Moon Marble Company in Bonner Springs, KS. 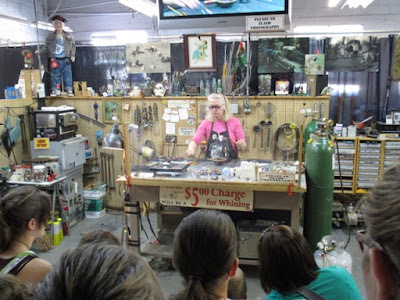 We attended a short demonstration on how hand-made marbles are formed. It was interesting, but not at all what I expected. The demonstration area consisted of a small section of bleachers for spectators to sit and watch an employee melt a glass rod and form one small marble. 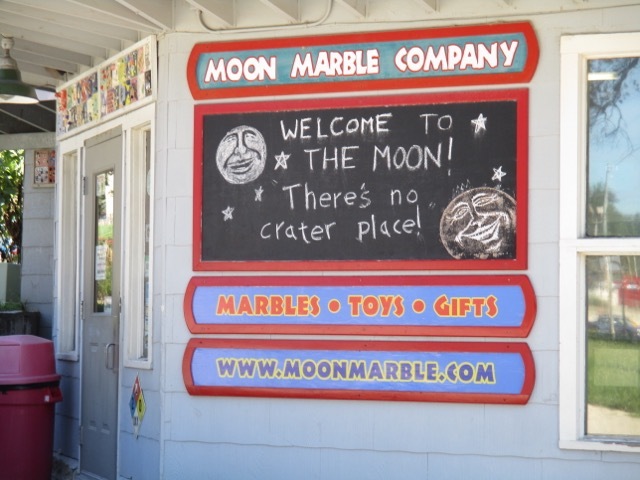 The gift shop in front of the demonstration area was packed with replicas of vintage games, marbles, and trinkets. Yes, it was a tourist trip, but a fun stop, too. 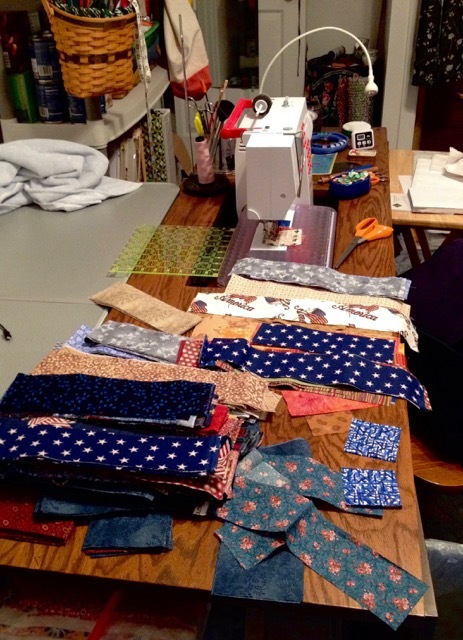 The Lander Sew Sistas adopted Quilt of Valor as an April project again this year: in 2015, they contributed to both Paintbox and Firecrackers. 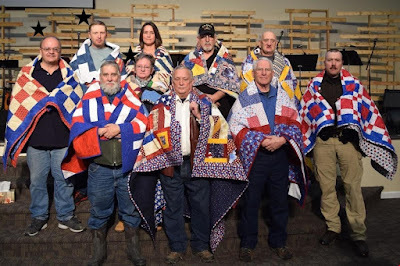 Because of physical therapy, I was unable to attend the work day, but the group came through with several pieced flags, and Mary H. made some more at home for an even dozen. 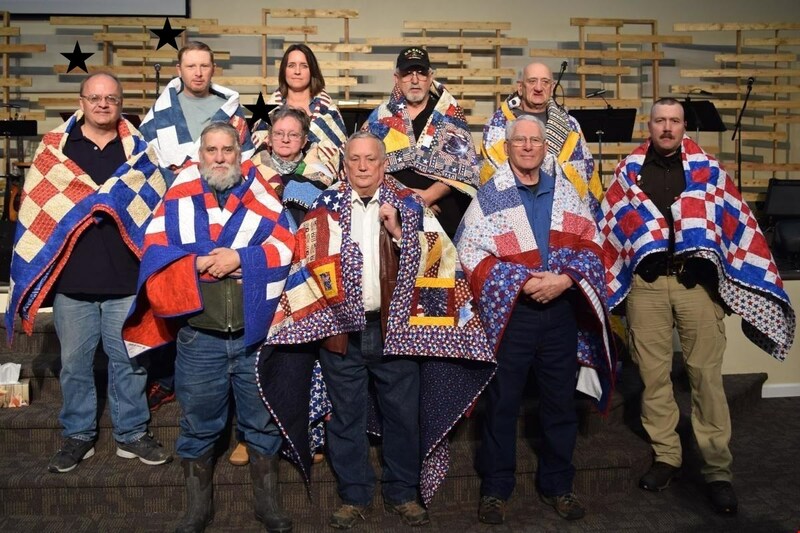 Thank you, Sew Sistas and Mary for making Connected Flags (QOV # 94) possible. The pieced flags were 6.5 inches unfinished and needed a pattern that would make them "pop" a bit. When I saw the pattern (link below) on Pinterest, I knew it would be perfect to showcase the flags the Sistas and Mary had made. Connected Flags was awarded on February 28, 2017. 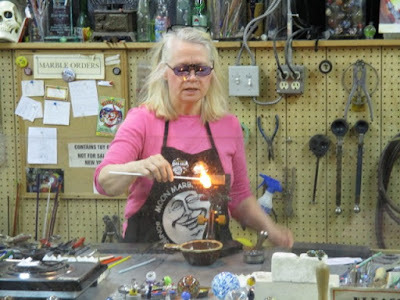 Article about the presentation can be found on County 10. 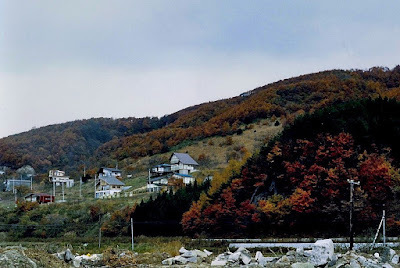 I lived on the main island of Japan, Honshu (the very northern section) for two years and delighted in the changing seasons: colorful foliage in the Fall followed by relentless typhoons where sheets of rain fell for days, cold temperatures and snow in the Winter, delightful Spring blooms (albeit because of more heavy rains), and heat and humidity of Summer that I mostly escaped because that's when I went home to Wyoming. 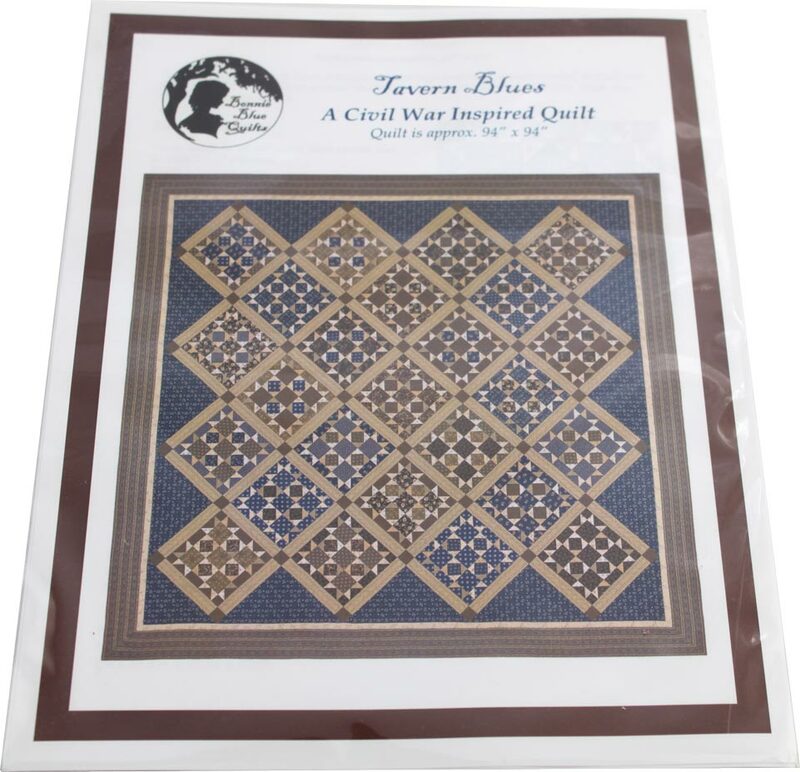 Tavern Blues, a pattern by Bonnie Blue Quilts, now called Red Crinoline Quilts, caught my eye about four years ago, and I began collecting fabrics: deep indigo bus, medium indigo/beige prints, light indigo/blue prints. I pursued the indigo selections in nearly every quilt shop I entered, and in some I spotted just the right shade. One of the shops Marilyn, Brenda and I visited last summer had the fabric for sashing and the setting triangles that was highlighted in the pattern, and since it was perfect, I bought yardage. Fast forward to last week, when I was straightening fabric in my sewing room, and decided the Tavern Blues collection needed to be in one box instead of stored in bags throughout the room. Most of it was in a plastic bin, but I found the odd shopping bags here and there in the sewing room. What on earth was I thinking when I blindly purchased this fabric (without referencing the pattern, I might add)? 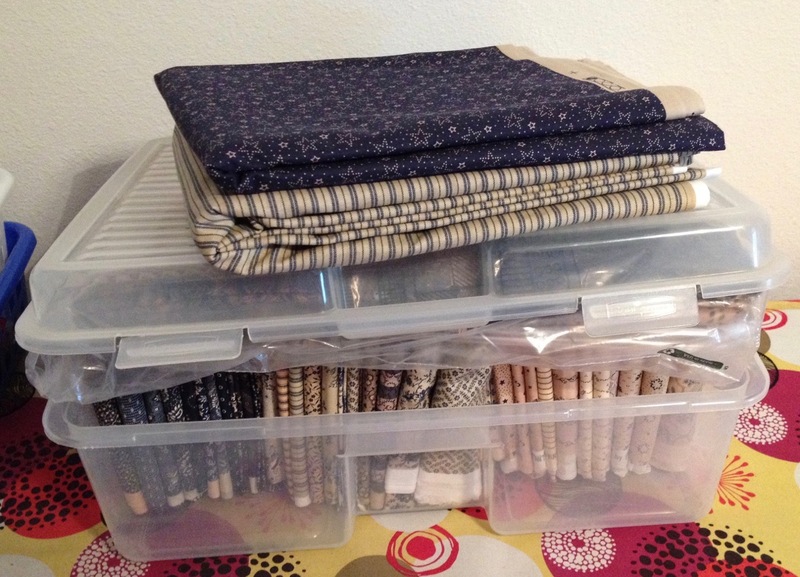 I'm sure I have enough fabric to make more than one quilt. Hindsight is telling me, I should have purchased a kit!